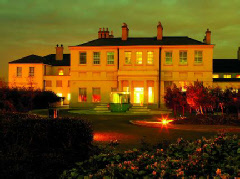 Built in 1792 for Sir Ralph Milbanke and extended in 1861, Seaham Hall is a classic country house near Sunderland which today houses a renowned spa hotel. Grade-II listed, its main historic significance is that it was in the upstairs drawing room that the poet Lord Byron married Anne Isabella Milbanke on the 2nd of January 1815. Indeed, if he were alive today he would probably recognize the location of his wedding if not other parts of the building – there is a contemporary feel to many of the rooms these days. It has also been suggested that Byron wrote a number of his works while at Seaham, including the tragic poem The Siege of Corinth. Benjamin Disraeli is also said to have visited the house in the 1860’s. 5 star rated, the hotel offers 20 guest rooms in all and is just a short drive from the city of Newcastle. It features not only an indoor swimming pool cleansed by ozone, but also a Turkish steam bath and fitness centre.